As high ranking officials begin to desert and others are being blown up, and now that the Red Cross has finally admitted that the current violence in Syria now constitutes a “civil war” some may wonder whether or not the rotten regime in Damascus is finally about to reap the whirlwind and be consigned to the “ashbin of history.” While there are questions as to whether or not any succeeding government in Syria would be democratic, let alone benign, and keeping in mind that the Assad regime has weathered major crises before, there is little doubt that the current uprising constitutes the greatest challenge to its survival. Despite the fact that the Syrian regime supposedly has a similar infamous reputation at being ruthless at quashing dissent as the late Baathist regime in Iraq, it seems as though it can no longer retain control through brute force for much longer. Is this the beginning of the end of more than forty years of rule by the Assad dynasty in Syria? Based upon empirical evidence betting on the Assad regime holding onto power indefinitely seems like a poor wager indeed. Most of the indicators of a doomed tyranny are present. Besides high level defections and the fact the Syrian opposition is gaining greater capabilities (as seen by the bombing attack that killed four high ranking Baathist officials recently) and increasing in numbers, the fighting has now reached Damascus itself. Given that the regime’s insincere efforts to appease and negotiate, combined with the use of force to stop the Syrian opposition has come to naught, the only chance it has now would be to launch a vastly disproportionate massacre such as it did against the Muslim Brotherhood in 1982 when it killed between 10,000-40,000 people in the city of Hama. However, even if the Syrian regime decided to up the ante such bloodlust would probably force the U.S. and NATO to finally intervene, at least via Airpower, and the result would probably be a replay of the successful campaign to overthrow Colonel Gadhafi in Libya last year. Indeed such a move towards such excess violence against the Syrian people would probably move Russia and China to abandon their support for the Assad regime, cutting off whatever significant materially aid Syria is getting abroad, as well as isolating it on the world stage. In fact it could be argued that Russian and Chinese support is the last hope Assad has left. There are precedents here; it was the removal of Russian diplomatic support, not the air campaign against Serbia, that ultimately ended the Kosovo conflict, and America’s decision to abandon Batista that led to Castro’s take over of Cuba. At the risk of sounding presumptuous it is likely that the Assad dynasty would crumble in a matter of days if the neo-commies (Russia and China) withdrew their support. Of course there is the chance that even under these circumstances Syria’s leadership would fight to the death regardless. If one looks at the composition of the Syrian elite they would not be blamed for thinking the end of the regime would result in sectarian violence. Most of the political, military and economic elite in Syria is composed of the small Alawi (an offshoot of Islam) and Christian minorities as well as a segment of the better off Sunni population. Meanwhile the vast majority of Syrians are relatively poor Sunnis that have little share in the economic success or notable positions within the military or political institutions. Of course the fears of sectarian violence are fueled by the horrible excesses that occurred between the Christians and Muslims during the “Lebanese Civil War,” and even more recently the triangle of violence between Sunnis, Shiites and Kurds in the aftermath of the removal of Saddam Hussein during the “Iraq War.” Much of the violence in these two conflicts was initiated by the elites (the Christians in Lebanon and the Sunnis in Iraq) who were afraid of losing their power base. There is no evidence to suggest that the Syrian Alawi and Christians’ response to losing their preeminence would be any more enlightened or humane. As for the potential of the Americans, NATO, or even Syria’s neighbors intervening in the conflict, with the possible exception noted above, the most likely any of them would do (or more likely are doing right now) would be to offer the rebels safe havens, intelligence, weaponry and supplies. Despite countless pundits stressing that an attack on Syria would be a more difficult task than the late war against Gadhafi most estimates regarding Syrian military capabilities give the Assad regime more credit than it deserves. In one of my earlier papers I pointed out that during the last sixty years the Syrians have not won a war, let alone a battle, of any significance. This despite the fact they have often outnumbered and outgunned their enemies. However, the same pundits usually point out the massive umbrella of SAMs (surface to air missiles) and anti-aircraft assets deployed across the country, noting their dense concentrations and relatively modern capabilities. While such defenses should not be taken lightly, they are certainly not as potent as they are made out to be. Thirty years earlier the Israelis destroyed all of Syria’s SAMs in the Beka Valley (which was then the largest concentration of anti-aircraft defenses in the world) without loss and even recently the Israelis somehow shut down the whole air defense system in Syria when they bombed a suspected nuclear site in the northeast of the country. Even more amusingly Israeli planes buzz Assad’s presidential palace without fear of consequence from time to time. There is no reason to believe that the even more technologically superior American air force, and arguably NATO forces as well, would not be able to defeat Syria’s air defenses, albeit probably needing more time and effort to do so versus the campaign in Libya. Of course there is the fact that the Syrians recently shot down a Turkish fighter jet, which cannot be discounted out of hand. However, there have been suggestions it was relatively easy for the Syrians do so because of the fallout of military ties between the Israelis and the Turks. Basically, the Israelis and Turks collaborated closely on the F-4 Phantom fighter jets in the Turkish air force with the Israelis continuously giving the Turks upgrades (including electronic countermeasures to defeat Syria’s air defenses). However, it is apparent that the latest upgrades were never given to the Turks since they unilaterally broke military ties with the Israelis after the controversial Israeli decision to forcibly stop the international flotilla heading to Gaza a few years ago. This has undoubtedly hurt Turkey more than Israel, and was a very stupid decision on the behalf of the Turkish government which was motivated by an erroneous belief in moral superiority regarding Israeli treatment of the Palestinians. I say “erroneous” because Turkey’s historical treatment of the Armenians and the Kurds has not been any more humane than Israel’s treatment of the Palestinians. Turkey is lucky that the Kurds do not have the lobbying power at the U.N, or among other governments, than the Palestinians do. Anyway, were the U.S. or NATO to intervene in the Syrian conflict it would most likely resemble the Libya intervention of last year. It would arguably be more difficult due to Syria’s superior military power vs. Libya’s, the lack of NATO bases close to the country and the fact that the conflict is more concentrated among urban centers rather than open desert. Once again being almost exclusively an air campaign it would probably prove more difficult in hitting tanks, trucks, artillery pieces and other conventional targets and also result in far more civilian casualties. On the other hand it could arguably lessens the length of the Syrian conflict as Western intervention would probably lead to the end of Russian and Chinese diplomatic support to Assad, boost the morale of the Syrian opposition while undermining that of the regime’s, and severely degrade the capabilities of the Syrian armed forces. While it is unlikely, and probably unwise for the West to intervene, it would surely not be as difficulty to do so as the skeptics claim. Perhaps the most important question regarding the likely collapse of the Syrian regime is what would follow it? The naive optimists usually say a more democratic successor, while the cynical realists would bet on a newly rejuvenated Muslim Brotherhood or some equivalent. Yet either of these would be better than the third potential option; sectarian strife on a comparable scale to what happened in Iraq. While it is tempting to look at the latest outcomes in Egypt and Libya, the circumstances in these two countries are far different than in Syria. In Egypt there was little violence when Mubarak was overthrown and the transition between military governance and the new pseudo democracy has been relatively smooth, if not ideal. Also, the Egyptian people generally respect their military despite the fact they have provided the last three presidents and were just as responsible for oppressing the Egyptians as they were. Finally, despite some violence between Sunnis and Coptic Christians there is little chance of Egypt descending into sectarian strife as in Iraq and Lebanon (not least because the Christian minority has little power to oppose the Sunnis). While the new Muslim Brotherhood President Morsai has not endeared himself to the West by stating he wants closer ties to Iran and is reviewing the peace treaty with Israel, there is no immediate reason to be overly concerned and it is possible the new government in Cairo will find some accommodation with the West (not least because of the significant amount of foreign aid Washington still gives to Egypt). Libya’s path to freedom was admittedly more violent, but despite some concerns it has not been overly unstable since the overthrow of Gadhafi. It is hoped that NATO’s role in finishing off the regime won the West some points with the Libyans, but it seems as a rule that whereas anything bad the West does in the region is usually remembered, anything positive it does is generally forgotten. However, to be fair relatively moderate candidates did better in the recent Libyan election than the fanatics. Either way, Libya’s geographic, political, and ethnic composition is too different from Syria’s to make it a valid comparison. It is no doubt frustrating for Arabs and Muslims to be pigeon holed into countless stereotypes. In fact many of the their countries are very different despite having a similar religious and cultural background. It would be like saying that the French, German, and British people are all the same. Which once again leaves us as to the likely fate of Syria as soon as the Assad regime implodes. Unfortunately, based on Middle Eastern history in general and Syrian history in particular, the prospects are not entirely hopeful. Since its independence in the late 40s’ until the early 70s’ Syria arguably went through more coups and governments than any other country in the region, if not the world. In fact, one of the reasons the Baathist party was popular, at least initially, was it finally gave the country some stability. However, that stability came at a cost and the Syrian regime, like its former secular counterpart in Baghdad was probably more bloody and repressive than the religious zealots in Riyadh and Tehran. While most of the countries in the region have initiated some reforms regarding personal liberties and economic incentives, Bashar al-Assad introduced only a few the first year or so he came to power and then quickly went back on them. No doubt the remnants of his father’s entourage, and the preferential treatment of the Alawi and Christians, quashed any serious chances of reform. Unfortunately, this leaves Syria with very few options. The ideal situation would be for the Sunni majority to offer amnesty to the Alawi and Christian minorities and give them a future role in the next administration. This would probably require allowing these minorities to retain a significant amount of power, at least in the economic sphere, to discourage them from turning to violence if they felt slighted. There are precedents here, as Boris Yeltsin allowed the old Communist elites (an obvious oxymoron) to retain much of their clout after the dissolution of the Soviet Union, and while it undoubtedly led to the powerful mafias that control much of Russia today, it was obviously preferable to a protracted civil war. Likewise, the Muslim Brotherhood would be wise not to overly challenge the military elite in Egypt, who control much of the economy and still have a monopoly on the use of force, as long as they allow it to govern the country. Seeing as though these officers care more about enriching themselves than promoting any ideology, it is possible they will ultimately reach an agreement. However the chances of this occurring in Syria are slim. More likely the Sunni majority, oppressed for decades under the Assad dynasty will want to dominate the next government and seek revenge on the Alawi and Christians minorities. There are simply too many instances of this happening in the Middle East, from the exodus of the pied noires from Algeria in the 60s’, the bloodletting of the Lebanese Civil War, Hamas’s treatment of Fatah after they conquered the Gaza Strip, to the near genocidal tendencies of the Sunni-Shiite strife in Iraq after the American invasion. The only exception the author can think of was the amnesty Hezbollah gave to the South Lebanese Army after Israel withdrew from Lebanon in 2000, and they certainly did not offer them a share in power. Perhaps the only way to avoid such a situation would be for the U.S. and the West to offer material and trade incentives to the new power in Damascus in exchange for leniency regarding treatment of the minorities. Whether or not this would work remains pure speculation. As to what faction would come to power in lieu of a collapse of the Assad regime given how little moderates are respected in the region, and given how organized and popular it tends to be in many nations it would be no surprise if the Muslim Brotherhood eventually came to power, as it did in Egypt. For some reason the masses in the Middle East, if not pretty much everywhere, hate educated moderates and tend to respect relatively extremist factions who have no qualms regarding oppressing other points of view and advocating violence. While some would point out that the Muslim Brotherhood, in Egypt at least, has renounced violence, it may have had something to do with the fact the Assad dynasty butchered the Muslim Brotherhood, along with 10s of thousands of civilians in Hama in 1982. Certainly, its Syrian equivalent is engaged in the brutal fight against the regime now that it has had a resurgence (it is typical of subversive groups to denounce violence when they are weak, as Fatah and Hamas have done at times when Israeli pressure has become overly coercive). There is also the potential that other less savory elements, such as Al-Qaeda or foreign guerrillas or terrorists that have gone to Syria to join in the fight, could have an impact on the next government in Damascus. However, this is unlikely as similar factions in the “Iraq War” and Libya ultimately failed to win any significant power in these respective nations. In the case of Al-Qaeda its extremist views, and often atrocious excesses, alienated most of the population, and the other movements were either too small or fragmented to be politically effective. No, the only real contenders are the slowly recuperating Muslim Brotherhood or some moderate faction that would be useful at courting Western aid and support in the aftermath of the Syrian Civil War. While some hope that the moderates could ultimately win due to the fact that Syria, like Iraq, is more secular vs. more fanatical countries such as Iran or Saudi Arabia, this is no guarantee any successive regime would be more moderate, tolerant, or even friendly towards Israel and the West. In fact, secular countries or movements have often been as hostile, indeed sometimes more so, than their religious counterparts. Nasser’s Egypt, Saddam’s Iraq, the Popular Front for the Liberation of Palestine, and Fatah were no less determined to destroying Israel and opposing the West than the Ayatollah, Al-Qaeda, or Hezbollah. In fact one could argue the secular movements have killed more people, especially their own, than the religious nut jobs. Anyway, the moderates, who are generally more peaceful and pro-west, are usually seen as puppets of the Israelis or the West. This is why Fatah, once at the forefront of the Palestinian cause, has become hated by the masses in the region ever since it took control in the occupied territories and become less radical. Likewise, the Pro-West regime in Beirut has less teeth in Lebanon than Hezbollah, and the Shah of Iran is still seen as a traitor despite the fact the theocracy in Iran has been more bloody and oppressive. Put another way, there is a reason only two countries in the region have made peace with Israel; Egypt and Jordan. In the case of Egypt, Anwar Sadat, the man who signed the peace treaty was gunned down by extremists, and the late King Hussein of Jordan survived countless assassination attempts, squabbles, and even a civil war by elements that questioned his resolve to fight Israel. Being accommodating to the West in the Middle East is simply too dangerous of a game for factions in the region to attempt earnestly. This leaves the Muslim Brotherhood, or some other extremist faction, as the likely successor to any Assad regime. This by itself is not necessarily bad for Western interests. So far the relationship between Egypt and the West has not faltered after the coming to power of the Muslim Brotherhood in that nation (no doubt the billions of dollars in aide provided by Washington has played a significant part). Even unstable elements such as Colonel Gadhafi, the Taliban, and the late Hafez al-Assad (Bashar al-Assad’s father) have all at one time or another proven able to do business with the West, as long as it has been in their interest. The key words are “in their interest” as they have all ultimately ended up as implacable enemies of the Israelis and the West. This implies that after the wanton destruction of Syria in lieu of the civil war, it is likely that whoever is in charge, even the Muslim Brotherhood, will probably seek good relations, at least initially, with the West, if only to rebuild and get the country back on its feet. While it is possible that the successors of the Assad regime could instead seek continued relations with its usual supporters, the Russians and Chinese, it is unlikely given that their unequivocal support of Assad has probably made them targets of hatred among the Syrian populace. Either way, such a pro-west stance could arguably only last as long as it is was convenient for the new power in Damascus. Given the likely chance that a Muslim Brotherhood administration would arguably be no less democratic or tolerant to women, and given that such policies have inevitably led to disenchantment and economic backwardness in nearly every single government and country in the region since independence of European hegemony, the end result would probably be an angry and resentful population looking for someone to blame. Without exception, not wanting to be blamed themselves, the Muslim Brotherhood would play the usual card of Arab despots and pin responsibility on the Americans and the Jews. This practice, sad and predictable as it is, seems to be the circle of life regarding every new ideology, faction, or regime that is introduced into the Middle East. At the risk of being labelled a cynic, I cannot see how the Muslim Brotherhood, which served as the forerunner of Al-Qaeda, could possibly break this cycle. Anyway, considering the Assad regime is most likely going to fall, and since the West and Israel will have to work with whoever comes to power in Damascus, the only sensible thing would be to embrace the new leadership and make earnest attempts to try to come to some sort of an accommodation. While it is by no means probable that any new regime would be pro-west or reciprocate such efforts, in the end no serious person would be able to say that the Israelis or West did not at least try to do their best to try to work with the new regime. I say “no serious person” because there is always going to be some people who think everything in the Middle East is the fault of the West or the Israelis, and that the Russians, Chinese, or the many undemocratic and bloodthirsty elements in the region could never do no wrong. Besides the debate as to who will inherit the throne in Damascus, there is the larger question as to what will be the wider impact upon the region, if not the world. While optimists and fear mongers often exaggerate the likely effects regarding their extreme preferences, it is admittedly easy to consider the best and worse case scenarios. Regarding the best case scenario, as I noted in a previous paper a new power in Syria could at first seem intoxicating. A Syrian-Israeli peace treaty, a Lebanese-Israeli peace treaty, the weakening of both Hezbollah and Hamas, and an increasingly isolated Iran (as Syria is her only significant ally in the region) are all potential benefits of a post Assad Syria. Middle Eastern history since the late 1960s. The absolute worse outcome would be a war between Israel on one hand and Syria, Egypt, Iran, Hezbollah and Hamas on the other. As unlikely as this seems it should be noted that most recent wars in the region have originated from stupid catalysts from the Kuwait ambassador telling Saddam Hussein that Iraqi women are whores, to Israel bombing Lebanon into rubble over the kidnapping of two soldiers. Being more realistic, negative effects would include an increase of support for Hezbollah and Hamas, closer ties with Iran, and perhaps Syria joining Iran’s attempts in constructing nuclear weapons. Obviously, all this implies the Muslim Brotherhood or some other extremist faction winning power in Damascus. 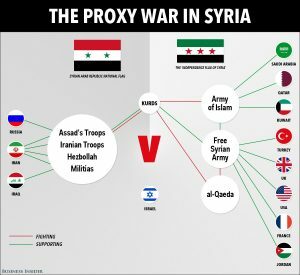 While it is too simplistic to suggest a pro-west faction would result in near perfect relations with Israel and the West and an Islamic faction would result in all out war, there is little doubt that depending upon who takes power in Syria we could see a vastly more stable, or chaotic, Middle East. Either way, no matter who succeeds Assad, relations are likely to be amiable at first considering they will probably need Western assistance to rebuild Syria. However, as cautious as the author is about the Muslim Brotherhood coming to power in Syria, one should not conclude that he has the least amount of sympathy for the Assad regime, nor that he would prefer it to the Muslim Brotherhood. Considering the current regime in Syria is likely to fall, it would be wise for the West and the Israelis to do everything to curry their favor and try to allay their fears of duplicity. While the undemocratic regimes and movements in the region have done much to warrant Western suspicion, it is also the case that Israel and the West have done just as much to warrant Muslim and Arab suspicions. While the author is not idealistic or naive enough to think that the current civil war in Syria will ultimately result in a more peaceful Middle East, perhaps it would not be a sin to hope it could. In the summer of 1990 Iraq invaded Kuwait. Catching the rest of the world by surprise Saddam Hussein assumed the Americans and the West would accept his fait accompli and do nothing. He was wrong. Given Kuwait, and neighboring Saudi Arabia’s considerable oil reserves, and Saddam’s reputation as an unstable maverick, the U.S. decided to make a stand and fight for Kuwait. In perhaps the most efficiently waged conventional war in military history the American-led Coalition decisively defeated the Iraqi army and drove it from Kuwait at negligible cost. However, despite being victorious in the short term the long term effects of the “Gulf War” would ultimately prove much more calamitous for America and the West. The origins of the “Gulf War” date back centuries in general, and the 1970s in particular. Ever since Islam became a contending power in the region the area between Mesopotamia (modern Iraq) and the heartland of Persia (modern Iran) has been an extremely volatile flashpoint. The Ottoman Empire, and the Persian Empire (especially after the latter became dominated by Shiite ideology instead of the traditional Sunni Islamic doctrine) in particular saw each other as apostates and constantly sought each other’s destruction. Even after centuries of Russian and British Imperialism, the dismemberment of the Ottoman Empire, and the creation of new nation states in the region after the “First World War” this seemingly intractable conflict passed on to Iraq and Iran with little respite. The more immediate causes began in the 1970s when an increasingly powerful Shah of Iran, strongly backed by the Americans, forced a weaker Iraq to acquiesce in an unbalanced treaty to give Iran more influence on the Shatt al-Arab river, which serves as a de-facto Iranian-Iraqi border, to Iran (the British had previously negotiated a treaty favoring Iraq in this respect as Britain was traditionally the power broker in the region and Iraq had been her colony). Saddam Hussein was the Iraqi Vice-President at this time and never forgot the humiliation this treaty reaped upon his country. However Iran, with its ever growing military that was on the cusp of becoming the foremost military power in the region, was seen as too tough and the Iraqis felt as though they were not strong enough to challenge them. The “Iranian revolution” of 1979 seemingly changed all of this. The ever increasingly fundamentalist, and anti-American tone of the revolution shut out U.S. military aid, neutralized the effectiveness of the Iranian Army (which had been pro-Monarchy) and encouraged the Iraqis to believe they could fight and win a short, decisive war, to their advantage and redraw the balance of power in the Gulf. Additionally, the new leader in Iran, Ayatollah Khomeini, a power hungry fanatic who disguised his intentions to take over Iran posing as a moderate democrat, urged the Shiites in Iraq (who were both oppressed under Saddam and compromised the majority of Iraq’s population) to overthrow the Baathist regime in Iraq and even sponsored terrorist attacks encouraging them to do so. While Saddam Hussein is rightly seen by history as a cruel, ruthless and cynical man who cared nothing about his own people there is little doubt that the new regime in Iran did much to provoke his wrath. 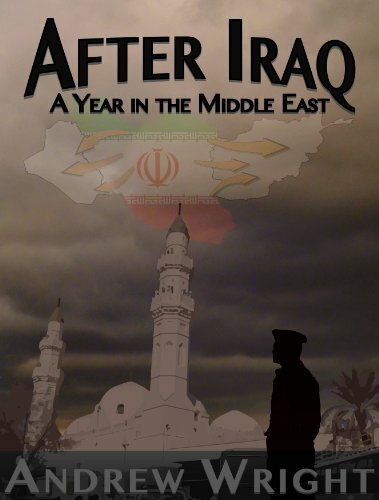 The resulting “Iran-Iraq War” was a lengthy, indecisive, and violent conflict. Essentially, the Iraqis invaded Iran thinking they could easily occupy a few strategically important points, destroy the new theocratic regime in Iran, and become the new power brokers in the Gulf. However, Iraq’s overconfidence proved to be a major error. The Iranians rallied to defend their country, the new regime was bolstered, not shattered, and Iraq found itself bogged down in an attritional struggle its smaller population vs. Iran could not afford. Eventually Iraq was pushed out of Iran and the Ayatollah decided to invade Iraq to destroy the secular Baathist regime and spread the Iranian revolution aboard. However, like the Iraqi invasion of Iran, this was also a mistake, as the Iranian forces (with few tanks and artillery and based mostly on fanatical conscripts with little military training) were slaughtered using human wave tactics against a mostly modernized Iraqi army defending its own territory. This farce continued for nearly 8 years until Iraq, backed by considerable international aid, sufficient military reforms, and the collapse of Iranian morale, counter-attacked and pushed the Iranians out of Iraq and accepted a cease fire that ended what was arguably the most pointless war in modern times. In the end the butcher’s bill was nearly 1 mission casualties, cost Iran and Iraq together more than a trillion dollars, and resulted in no territorially, strategic, or economic gains for either side. Iraq had won the conflict militarily, but economically the country was in ruins. While Saddam Hussein felt as though he had been fighting for the rest of the Sunni world he was soon angry at what he felt was their ingratitude. During the war Iraq had acquired considerable debt, mostly owed to Saudi Arabia and Kuwait. Despite the fact Iraq, in his view, had been fighting to stop the Iranians from spreading their revolution across the region Saudi Arabia and Kuwait felt little sympathy for Saddam Hussein, did little to ameliorate Iraq’s economic malaise, or ease up regarding the vast debt it owed them. Even more insulting to Iraq was the Kuwaiti practice of slant drilling, which allowed Kuwait to drill for oil across the Iraqi-Kuwaiti border. Frustrated by these considerations Saddam Hussein met with Kuwaiti officials to try to help Iraq’s economic woes and stop Kuwait from stealing Iraqi oil. Either way in early August 1990 the Iraqi army invaded Kuwait and secured the small kingdom with little difficulty. The invasion took the region, the West, and the United States by surprise. While some scholars suggest that the Americans should have had an inkling of what was going to happen because Saddam Hussein had recently been threatening and had used bellicose language towards Kuwait, and had recently met with the U.S. ambassador to Iraq to determine the American position regarding the political stand off between Kuwait and Iraq, no one in Washington D.C. expected the situation would escalate into war. To be fair Arab leaders use bellicose language and threats all the time (usually to satisfy domestic opinion) and it almost exclusive never results in conflict or war. Perhaps it is much safer to assume that much like Pearl Harbor, the fall of the Berlin Wall, and September the 11th, that America’s intelligence community failed to predict Iraq’s invasion of Kuwait. Yet considering Saddam Hussein made the decision to invade Kuwait spontaneously it is perhaps unfair to seriously criticize America’s intelligence organizations. Indeed, perhaps the best indication of Washington’s ignorance about the gathering storm in the Middle East was that the Elder Bush regime seemed oblivious and unsure of what to do in the aftermath of the fall of Kuwait. In fact, it was arguably Margaret Thatcher, who apparently lectured Bush about the lessons of appeasement during the 1930s, and the Saudi King, who requested American ground troops to protect Saudi Arabia, that convinced George H. Bush to make a stand in the Gulf. Interestingly, Osama Bin Laden had offered the Saudi King to raise 100,000 mujaheddin (holy warriors) to expel Saddam’s army from Kuwait. While the King did not say why he refused Bin Laden’s offer it was probably because he assumed that bands of lightly armed fanatics would arguably not have done well fighting the strong conventional Iraqi Army in the largely open dessert that was Kuwait and northern Saudi Arabia. Considering a prior mujaheddin force had suffered disproportionately heavy casualties fighting the Soviets in Afghanistan, a country well suited for Guerrilla warfare and terrorism, it is incomprehensible how Bin Laden thought he would do better in terrain that gave an indisputable advantage to the Iraqis. In fact when asked by the Saudi defense minister what his holy warriors would do in the face of Iraq’s 4000 tanks, considerable artillery, Republican Guard divisions and stocks of biological and chemical weapons Bin Laden replied “we will defeat them with our faith.” Perhaps there is a reason that the majority of respected military treatises are written by cynical atheists, and not idealistic zealots. Either way, once the Saudi King requested American military aid, George H. Bush deployed advance forces to the Gulf and proceeded to amass a respectable international Coalition to isolate Saddam on the world stage, and prepare to liberate Kuwait by force if necessary. The Coalition eventually amassed was an odd assortment of Western European and Asian democracies, traditional allies in the Middle East, a rogue Syria, and Canada. Notably absent was the state of Israel, due to Arab hostility, perhaps illuminating how little strategic use the Jewish state gave the Americans in the post Cold War era. Saddam Hussein for his part was left with diplomatic support from the Palestinians, as he had been a steady financier of their activities, and a reluctant Jordan as the majority of its population was Palestinian. Perhaps most surprisingly was that the Soviet Union, which was in its dying days as a superpower, unexpectedly decided to remain neutral and did not back Iraq, which it, along with France, had done so much to build into the world’s 4th largest army. Because of this, and probably because China was keen to repair its international reputation after the “Tiananmen square massacre,” there remained no country to veto the U.S. resolutions at the U.N. which brought together the Coalition and authorized the use of force to expel Saddam Hussein from Kuwait. This was in contrast to the situation leading up to the “Iraqi War” a decade later when France and Russia conspired to prevent America from getting U.N. authorization to invade Iraq. While with hindsight there is no doubt that America was incorrect, if not misleading, regarding its justification for going to war (as in Iraq’s supposed weapons of mass destruction and links to Al-Qaeda) both France and Russia’s motives were cynical and transparent as not only were they the two major countries who had armed Iraq during the 1980s, but also significant importers of Iraqi oil. While America somehow gets the most censure for its limited support of Iraq during the “Iran-Iraq War” they had only provided 200 million dollars of military aid to Saddam vs. nearly 40 billion given by Russia and France. Yet despite the building of such an impressive Coalition in 1990 the question remains as to why George H. Bush felt as though he had to go to war. While the aforementioned reasons such as Margaret Thatcher and the King of Saudi Arabia’s appeals did much to motivate the President these were subsidiary considerations at best. Clearly the Americans’ close connections with the Gulf countries, making of a clear example of Iraq to other rogues states, and liberating Kuwait from Saddam’s tyrannical rule, were also important factors, but there was another, arguably decisive, reason involved. That reason was oil. Roughly speaking, Iraq by itself controlled 10% of the world’s proven oil reserves, Kuwait another 10%. Saudi Arabia, within reach of Iraq’s vastly superior army, had 20%! America was, and still is, mostly non-dependent upon oil from the region, but the same could not be said about Japan or much of Europe. If Saddam Hussein conquered Saudi Arabia he would control nearly 40% of the world’s proven oil reserves. While this undoubtedly gives ammunition to the typically one sided types who think that America, Israel and the West are always the bad guys and lends some credence to slogans such as “no blood for oil,” it does not address the consideration that maybe a rogue state such as Iraq controlling such an important commodity is arguably not a good thing. Even though it is not difficult to find dirt on any nation, democratic or despotic, Iraq especially deserved condemnation as a rogue state. While most dictators in the Middle East do not shy away from blood letting, Saddam Hussein in particular was a very dangerous man. His constant backing of Palestinian and other terrorist organizations, his brutal suppression of Iraqi Kurds and Shiites, his invasions of Iran and Kuwait, and his use chemical weapons made him a pariah even among his repressive neighbors. To suggest that the Americans should have done nothing and let such a state wield so much clout in an geopolitically crucial region is laughable at best, and foolish at worst. Given the considerable stakes, and since Saddam Hussein was unwilling to backdown and lose face, it seems that with hindsight there was very little chance diplomacy could have averted war after Iraq had conquered Kuwait. Nonetheless it would take the Coalition many months to complete its build up in Saudi Arabia and be ready to initiative offensive operations against Iraq, and in the meantime several initiatives were tried by the Soviets and the U.N. to attempt to solve the crisis peacefully. Needless to say, all these initiatives failed and when Iraq failed to withdraw from Kuwait according to the deadline the U.N. and Coalition had set for January 15, 1990 the defensive deployment to Saudi Arabia, “Operation Desert Shield,” became “Operation Desert Storm,” the removal of Iraqi forces from Kuwait via offensive means. On paper at least, the opposing sides did not seem as unbalanced as later events would prove. Iraq supposedly had more men and tanks in the theatre of war and much of their artillery outgunned the Coalition’s. Iraq was also thought to have an advantage in staying power as the Western Coalition members in particular were afraid of a long war and significant casualties. Iraq also had eight years of recent combat experience fighting the Iranians while the Americans last major ground war had been 20 years earlier in Vietnam, which they had lost. Most pundits, think tanks, and military experts predicted that the war would be long, bloody and attritional. There were rumors that the Americans had shipped 100,000 body bags to the Gulf in the expectation of heavy casualties. In fact Saddam Hussein’s plan, if it could be dignified as such, was essentially to stage a repeat of the strategy that defeated the United States in Vietnam; prolong the war, inflict significant U.S. casualties and wait until the American people tired of the conflict and forced its army to withdrew. How he intended to wage such a war in a situation so different from Vietnam remains a mystery. In Vietnam the terrain, rules of engagement, and faulty American military doctrine had prevented the U.S. from prevailing. Essentially, the jungles of Vietnam were unsuited for the conventional oriented strategy of the U.S. army to find and destroy the opposing enemy, who were mostly, but not exclusively, insurgent forces that used Guerrilla Warfare to strike enemy weak points and then withdraw. The rules of engagement were also a handicap to the Americans as the military was often prevented from using whatever force they felt necessary due to sensitive political considerations (such as limiting civilian casualties or the presence of Chinese and Soviet personnel in Vietnam). What Saddam did not know, or ignored, was that the situation in Iraq and Kuwait was much more advantageous to the Americans than in Vietnam. The terrain, mostly open desert, clearly favored the conventional doctrine of the U.S. army and the Coalition commanders nearly had a freehand in using unlimited force to accomplish their goals. While Iraq supposedly had some advantages in numbers and ability to stomach casualties, in reality they were completely outclassed by the Coalition. In terms of leadership, training, doctrine, technology, firepower, communications, naval and Airpower the Coalition had an indisputable superiority via a vis the Iraqis. Any advantage, real or imagined, that the Iraqis had in the coming conflict was quickly quashed by these factors. While Saddam Hussein hoped to use his bulky military to prolong the war and destroy American political will, the Coalition planned to use their advantages in technology, communications, and mobility to quickly neutralize the Iraqi armed forces and force them from Kuwait. Perhaps the two most important assets the Americans had during the conflict was in air power and net-centric warfare. Air power, especially air supremacy, is a dominant consideration in conventional warfare and its impact on the “Gulf War” will be discussed shortly. Net-centric warfare is less well known, but arguably as decisive. It allows a major advantage to a combatant who has invested heavily in communications and information technology to allow an accurate picture of the battlefield, the quick dissemination of reliable intelligence to troops on the ground, and facilitates quick decision making among rank and file. Put simply it lets the side with superior communications to make quicker, and more informed, decisions during war. While not an example of net-centric warfare per se a good example was the “Battle of France” in 1940 when the Germans, who had radios in their tanks and aircraft, managed to efficiently coordinate their forces while the French, who had more forces in general, had few modern communications and conducted themselves in a mostly clumsy manner. The American strategy during the “Gulf War” was in general reliant upon Airpower. It consisted of two phases once “Operation Desert Storm” began. The first phase, lasting 6 weeks, was a multi-layered aerial campaign designed, in general terms, to undermine Iraq’s ability to wage war. During the second phase, lasting a mere 100 hours, Airpower was almost exclusively devoted to providing air support and interdiction during the ground war that decisively defeated the Iraqi army and liberated Kuwait. 1) Destroying or neutralizing the Iraqi Air Force and Iraq’s anti-aircraft capabilities to gain air-supremacy over the battlefield. 2) Disrupting the Iraqi military’s Command and Control capabilities to isolate the Iraqi troops from their leadership and prevent them from effectively coordinating their forces. 3) Eliminating Iraq’s existing or potential Weapons of Mass Destruction (besides his known stock of Biological or Chemical weapons, Saddam had a relatively advanced Nuclear Weapons program). 4) Taking out Saddam’s mobile Scud launchers. 5) Softening up Iraqi forces, physically and morally, prior to the ground campaign. Obviously the success of the aerial campaign would depend upon whether or not Coalition air forces could accomplish the first objective. While the Iraqi Air Force was modern and competent enough, having fought against Iran for 8 years, it was obviously not going to fare well against a Coalition of the foremost Western military powers endowed with the best available technology in aerial warfare. After fighting a few futile battles against the Coalition the majority of the Iraq’s warplanes flew to Iran and other countries and stayed grounded for the remainder of the war. When Saddam Hussein asked Iran to return the planes after the “Gulf War” the Iranians more or less responded by saying “give what back?” Thanks to the mauling the Iraqi army suffered due to the conflict Saddam had little recourse against Iran but to brood. Unfortunately for the Iraqis, and arguably helped by Reagan’s massive defense spending during the ’80s, American Airpower, including its Suppression of Enemy Air Defenses (SEAD) capabilities, was vastly superior to the newest soviet technology. The Iraqi radars could not track the new American stealth fighters and bombers, and their missiles and guns could do nothing to take out all the precision guided munitions that quickly crippled Iraq’s anti-aircraft system. Within a few days the lion-share of the task was over and the Coalition was free to bomb the Iraqis anywhere with near impunity. Often the warplanes employed jamming and spoofing techniques to neutralize Iraqi radars while other times warplanes simply flew above the effective range of much of the AAA and SAMs. While the Coalition’s immediate success was seen as a military revolution by many, a few military experts who had remembered the Israeli air force’s brilliant victory over Syria’s SAMs in the Bekaa valley in 1982 (which had been the most dense deployment of the Soviet’s most modern anti-aircraft assets in any conflict during the “Cold War”) were hardly surprised. The aerial campaign’s objective’s 2 and 5 were also extremely successful and were the result of good intelligence, first rate communications, and the application of overwhelming firepower. Precision guided munitions, which comprised between 7.5 and 10% of aerial munitions during the war, were mostly used to take out smaller and more dangerous targets such as AA defenses, headquarters and communications centers while the majority of the rest of the more simplified iron bombs focused on large targets or significant concentrations of Iraqi forces (mostly tanks, APCs and artillery). This part of the aerial campaign worked so well that Iraqi military communications were more or less cut, and Iraqi troops were so demoralized that they put up little resistance once the ground campaign began in late February. Coalition efforts to take out Saddam’s scud launchers were less successful. Thanks to their mobile nature, the practice of moving after every launch, and their haphazard deployment all across Iraq, Coalition warplanes found it difficult to find and destroy them. While from a military and strategic point of view the scuds, few in number and notoriously inaccurate, were an inconvenience at best, from a political and diplomatic standpoint they potentially threatened the cohesion of the Coalition. As stated above Israel was never invited to take part of the Coalition due to the fact that most of the Arab members loathed the Jewish state. The Arab countries arguably hated Israel more than they did a rogue Iraq. Saddam Hussein tried to exploit this by using his scud missiles to target Israel, hopefully provoking them to retaliate and thus somehow collapse the harmony of the Coalition. Thanks to their inaccurate nature, and extensive Israeli precautions, the limited amount of scuds that hit Israel inflicted few casualties. However, the Israelis, always keen to enact their long standing strategy of deterrence via overwhelming force, wanted to hit back hard. Fortunately, President Bush promised the Israelis that hitting the scud launchers would become a top priority for the Coalition and despite the fact that postwar research revealed that not a single scud launcher was hit from the air there was probably enough air missions launched, as well as special forces devoted to finding them on the ground, to at least keep the scud launchers moving or hiding and thus decrease the amount of salvos they could shoot at the Jewish state. The amount of sorties devoted to scud hunting was clearly regarded as controversial by the military establishment. While some studies suggest that roughly 2500 air sorties (2% of all strikes) were devoted to the threat General Schwarzkopf, in his memoirs, suggested that anti-scud missions represented a third of all daily combat missions. While it is hard to explain such a disproportionate difference in estimates, and while it is easy to criticize so many air sorties on missions that clearly did not succeed in hitting a single scud launcher, the political importance of maintaining the Coalition’s cohesion clearly justified such means. Additionally, it is obvious that the considerable amount of scud missions did not significantly distract Coalition Airpower from completing its other missions. The attempts to seriously destroy Iraq’s WMD capabilities were also limited. This was mostly the result of the countless wide ranging facilities across Iraq, the continual movement of WMD assets across the country, and the limited intelligence available to the Coalition. While considerable damage was done, and much of its existing stocks of biological and chemical weapons were eliminated, Iraq still had considerable amounts left, as well as the continued ability to create them at the end hostilities. Likewise, as the Gulf War Air Power Survey noted a few years after the war, Iraq’s Nuclear Program was only delayed, not halted, by the considerable efforts of Coalition warplanes. Fortunately, and despite all the bureaucratic interference and Iraqi intransigence, it would appear that U.N. inspectors after the war ultimately succeeded in neutralizing Saddam Hussein’s WMD capacities. Had this been confirmed prior to 2003 and had Saddam Hussein been more cooperative there is a good chance the subsequent invasion of Iraq would never had occurred. Other targets of the air campaign included power plants, oil targets, infrastructure and interdiction. In general the point of these strikes were to cripple Iraq’s ability to wage war, isolate the Iraqi army from supply, and prevent them for escaping encirclement and destruction once the ground campaign commenced. While these efforts seriously inconvenienced the Iraqi war effort, resulted in many shortages for the Iraqi army, and helped produce the rout of Iraqi forces during the ground campaign, in the event the annihilation of the Iraqi army would prove to be elusive. As for how many Iraqi tanks, armored vehicles, artillery pieces and men were neutralized during the air campaign this depends upon what criteria is used to measure its effectiveness. While sources vary perhaps a good indicator, according to the Gulf War Air Power Survey previously cited, could be gleamed from the observation of a sample of Iraqi tanks found that had been either destroyed or abandoned during the conflict. Of the supposed 2633 Iraqi tanks that had been neutralized during the conflict observers collected extensive data regarding 163 of them and noted a few interesting findings. Of these tanks perhaps 10-20% of the had been hit by air munitions, 30% by ground forces or artillery, and almost half had not been hit at all. This means that not only had the ground campaign damaged or destroyed more tanks than airpower, but that much of the time the Iraqi tank crews had fled instead of fighting. Even though this data was collected from a small sample of the total tanks neutralized, it seems to make sense considering that as soon as the ground conflict began most Iraqi troops either surrendered or fled, rather than stand and fight. While the small number of tanks destroyed or hit by air munitions almost seems to suggest that Airpower was not as decisive in the conflict as is generally thought, it should be noted that it was because of the awesome display of Coalition air power that Iraqi crews abandoned their tanks and Iraqi soldiers surrendered, or fled, in droves. The Iraqis quickly discovered that they were outgunned and that their tanks and vehicles were being targeted more extensively than they were and thus they often wisely abandoned them. War is based just as much (in fact often more) on psychological as material factors, and these abandoned Iraqi vehicles were clearly victims, directly or not, of Coalition air power. This was not without precedent as the same phenomenon was observed during the “Six Day War” in 1967. While most accounts of that war give disproportionate credit to the IAF (Israeli Air Force) the Israeli ground forces destroyed more tanks and armored vehicles. As in the gulf conflict the IAF destroyed or damaged a small amount of such vehicles, but its psychological effect helped to decisively rout the Arabs and allowed the Israelis to capture scores of Arab armored vehicles intact. As soon as the air campaign had mostly completed its objectives by late February, Coalition air power was re-directed towards supporting ground forces attacking the Iraqi army and liberating Kuwait. The plan for the ground campaign was devised by General Norman Schwarzkopf, the defacto commander of Coalition forces, and was loosely based on Hannibal’s perfect victory over Roman forces at Cannae in 216 BC. Essentially the Iraqis were fooled into believing the main attack would be a frontal assault against the Saddam line (which stretched from the Kuwaiti coast, to along the Saudi-Kuwaiti border and then covered some distance along the Saudi-Iraqi border as well) supported by an amphibious assault near Kuwait city. The Coalition accomplished this feat by an electronic deception campaign which convinced the Iraqis that the majority of Coalition forces were in the east of the frontier and by the 17,000 U.S. marines that were openly practicing amphibious assaults in the Gulf. While Iraqi attention was focused on the Kuwaiti coast and the Saddam line the strongest parts of the Coalition, including the French and British contingents and best U.S. armored forces, were stationed far to the West. Their objective was to sweep around the Saddam line, engage and destroy the Iraqi army (especially the strong republican guard divisions) in Kuwait and southern Iraq, and then liberate Kuwait. These forces were only supposed to commence their advance a few days after the Coalition forces assaulting the Saddam line had pinned the Iraqis to the front so that the forces in the West had a better chance of encircling the Iraqi army from behind. It was hoped that with such a coup de main and Coalition air power having softened up the Iraq army that the ground campaign would be relatively brief (General Schwarzkopf estimated it would take 3 weeks). It may seem incredible that the Iraqis did not consider that the Coalition would try to outflank the Saddam Line, but the deception campaign, lack of knowledge about GPS (which helped the Coalition navigate the desert) and the typical inclination of dictators to believe they are infallible probably explains this gross miscalculation. Besides, military history is full of examples of countries over-relying on defensive lines that can easily be outflanked from the Maginot Line in France to even the Great Wall of China. The ground campaign began on February 24th 1991, was concluded in 100 hours, and can be described briefly. As stated above the plan was for Arab and U.S. Coalition forces in the East to assault the Saddam line to distract the Iraqi army so that the stronger part of the Coalition forces to the West could encircle it from behind. Yet ironically, thanks to the comprehensive aerial campaign the Iraqi troops were thoroughly demoralized and surrendered in droves as the Coalition forces in the East began their advance. In fact, concerned that the Iraqi army would begin retreating before he delivered his coup de grace from the West, General Schwarzkopf ordered his left hook to advance much sooner than he had anticipated. The result was predictable as the Iraqis, already demoralized and surprised by the unexpected Coalition advance to outflank the Saddam line, were quickly routed and unceremoniously began to retreat. Whenever the odd pitched battle occurred, such as the “Battle of 73 Eastings,” it was one-sided and quickly won by the better trained, and equipped, Coalition forces. Even the much feared Iraqi Republican Guard turned out to be a paper tiger. While there are many factors that help explain why Coalition forces achieved such a decisive victory against the Iraqi army at such small cost perhaps the relative imbalance regarding their respective armored forces is illuminating. The Coalition had superior tanks with better trained crews. They had first rate intelligence thanks to GPS and their satellites (which meant they knew where to find the Iraqi tanks), could shoot at three times the Iraqi tanks’ range, had better munitions to penetrate enemy armor, and had thermal and laser sights (which the Iraqis did not) which greatly increased accuracy. This along with air supremacy and the demoralization of Iraqi forces prior to the ground campaign, was decisive. These same considerations, the Coalition’s advantages in training, equipment and technology, arguably applied in every other consideration during the “Gulf War,” and one can only wonder how Saddam Hussein thought he had a chance in hell of holding out against such disproportionate odds. Coalition ground forces destroyed more tanks, vehicles and men. The lesson here is not that one of the two branches is better or more effective than the other, but that both are necessary to succeed in warfare. This lesson was seemingly lost in the “Kosovo War” in 1999 and the “Second Lebanon War” in 2006. In the Kosovo conflict Airpower, much like during the “Gulf War,” destroyed relatively few tanks, APCs or artillery and whatever psychological effect it created was limited by the severe restraints placed upon its use by political considerations and the lack of ground forces to threaten Serbia. In fact, many commentators have suggested that the withdrawal of Russian diplomatic support for Serbia, not NATO’s military efforts, was the decisive factor that ended the conflict. Likewise, in 2006 the first rate IAF failed to destroy Hezbollah, let alone destroy or neutralize its ability to launch rockets at Israel, without ground forces putting pressure on them or overrunning its launch sites. The quick time it took the Coalition to accomplish its objectives (100 hours vs. Schwarzkopf’s initial estimate of 3 weeks), along with the lopsided casualty ratios, illustrate how much of a cakewalk the “Gulf War” really was. Estimates for Coalition casualties are easy to determine due to far fewer losses, better records, and the fact most of its members were liberal democracies. Coalition military casualties numbered roughly 500 dead and 800 wounded. Of this around 200 were killed in action, while nearly 300 were the result of accidents and friendly fire. Most of the casualties were American due to the fact the lion share of all forces, ground, naval and air, were from the United States. At least 1000 Kuwaitis were killed during the Iraqi occupation while Israel, which was not part of the Coalition, lost a handful of civilians due to Saddam’s scud attacks. As for equipment the Coalition lost few armored vehicles and 67 aircraft. This was not a significant number due to the fact the Coalition had 1800 warplanes and launched 111,000 air sorties during the war. To put it in perspective this represented a mere 3% of all deployed warplanes, or the equivalent of losing 1 plane per 1650 sorties (these loss rates were much more favorable compared to American aerial losses in “World War 2,” Korea, and Vietnam). Iraqi casualties are more difficult to ascertain due to their greater losses, the paranoid nature of the former Baathist regime, and the controversy regarding how many deaths the war cost Iraq in the long term. As for casualties caused directly by the war estimates have varied from 8,000-150,000 soldiers and between 2300-3500 civilians killed (not including wounded). A more certain figure was the roughly 86000 Iraqi soldiers who were taken prisoner. It is likely that military casualties were in the lower range of estimates, no more than 20,000 at most. While air power and the ground war did cause massive destruction it was not as overwhelming as is usually thought. As noted above, out of a sample of 160 Iraqi tanks the Coalition found that were neutralized only 10-20% were hit from the air, 30% from ground forces, and almost half were simply abandoned. While such percentages probably fluctuated dependent upon where Iraqi equipment was stationed, and to the degree of the effectiveness, and amount of, firepower devoted to neutralizing it, as an average standard it mimics similar statistics from conventional warfare in the 20th century. Not only were much less tanks and armored vehicles hit than originally thought, but it turns out that the Iraqis quickly distanced themselves from them once they realized the Coalition were more interested in hitting these vehicles than attacking soldiers on the ground. Most Iraqi soldiers were spread out over long distances, entrenched in the desert, and were usually not actively targeted until the ground war, which lasted only 100 hours. Most of them either deserted before the ground campaign, or fled or surrendered once it began. As for how much Iraqi equipment was destroyed these numbers are difficult to cite with certainty as well. The generally cited figures suggest that Iraq deployed to the Kuwaiti theatre of operations roughly 4300 tanks, 2900 armored vehicles and 3100 artillery pieces while the Coalition had fewer tanks, but more armored vehicles and slightly more artillery. In the air it was very lopsided as an estimated 700 Iraqi planes faced at least 1800 Coalition planes. But of course the Coalition’s real advantages were in technology, training, firepower and communications. Most estimates suggest that somewhere between 2500-4000 tanks, 1800-2400 armored vehicles and 2100-2600 artillery pieces were destroyed or captured by Coalition forces. These varying figures are even more complicated by the controversy as to how many were neutralized by air power vs. ground forces. If the rough estimates cited by the gulf air survey cited above are correct, then perhaps 40-50% (10-20% by air power, 30% via ground forces) of Iraqi tank losses were due to enemy fire while 50-60% were abandoned by their crews. It is likely, though not definitely, that the same percentage could apply to armored fighting vehicles. Of course it is implied that the demoralizing effect of the air campaign did much to motivate the Iraqis to abandon their equipment. However, in the case of artillery, the most feared and respected Iraqi combat arm, it would appear that counter fire from Coalition ground forces neutralized a significantly higher percentage than air power. This was due to the significant threat it posed to Coalition ground forces and the fact that once the Iraqis had warmed up their artillery batteries and fired, the Coalition’s sophisticated radar systems pinpointed and neutralized the majority of them with artillery and MLRSs. As for the Iraqi air force, as stated above it fought for a few days and then flew most its plane to Iran and other countries, never to return. However, despite the admittedly unsatisfactory estimates regarding Iraqi troop and equipment losses the results of the military contest were unequivocal. Kuwait was liberated with ease, Iraqi forces surrendered en masse or fled in an disorganized rout, and Saddam’s army was forever destroyed as an effective fighting force. Once the Iraqis began their retreat from Kuwait, though not before setting Kuwait’s oil wells on fire, they quickly became bottlenecked on the highway from Kuwait City to Basra. However, besides their own forces the Iraqis also withdrew from Kuwaiti with as much loot as they could bring with them in a fleet of busses, cars and every other imaginable vehicles available. This was the last act in a systematic Iraqi campaign to steal anything of valuable in Kuwait that was not bolted down enacted since Saddam’s army invaded in the summer of 1990. The American brass, infected with Clausewitzian doctrine that emphasized that “next to victory the act of pursuit is most important in war,” acted decisively as soon as they noticed the Iraqi bottleneck on the highway. In a typical tactic used to ambush enemy convoys from Vietnam to Chechnya American warplanes first bombed the front and rear of the Iraqi column, and then indiscriminately strafed the column end to end. Despite the postwar outrage regarding what was unequivocally a legitimate act of war, there were relatively few casualties, civilian or military, as most of those stuck on what was later named “the highway of death,” wisely abandoned their vehicles and fled into the desert. However, the potential political implications of the incident did much to quickly end combat operations in the Gulf. This was where the supposedly clean part of the “Gulf War” ends and all the messy and unresolved issues of the conflict began. 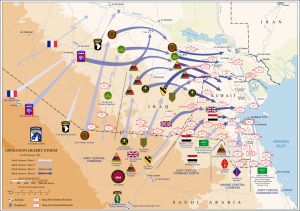 While the original goal of the Coalition, the liberation of Kuwait with minimal casualties, had been accomplished with surprising ease, many Coalition (especially American) soldiers wanted to up the ante by toppling the rotten regime in Baghdad as well. This should not have come as a surprise to many as George H. Bush had called upon the Iraqi people to overthrow Saddam Hussein. Unfortunately this was a mostly cynical decision on the part of the U.S. administration, as future events would subsequently confirm, considering neither the Americans, or anyone else in the Coalition, made serious efforts to aid the Iraqi people to do so. Why the Coalition never made serious plans to overthrow Saddam Hussein, yet encouraged the Iraqi people to launch an insurrection without the intent to provide significant assistance to them is one of the mysteries of the “Gulf War.” Firstly, it should be pointed out that neither the Americans, the Coalition, or the U.N. ever seriously considered, let alone planned, to invade and occupy Iraq, once the liberation of Kuwait had been completed. The Americans were not keen on occupying a foreign country as memories of the protracted and bloody conflict in Vietnam were still recent. The Coalition, particularly the Arab members, were also horrified at the prospect of Western and American troops occupying one of their neighbors considering the region had thrown off the cuffs of Western imperialism a mere generation ago. Finally, the U.N. and all of its bleeding heart apologists would never have sanctioned any operation such as the occupation of Iraq without U.N. authorization. While countless people since, including those for and against the U.S. invasion of Iraq in 2003, argue that the Coalition should have invaded Iraq back in 1991 the truth is that there was almost no political will back then to do so, and that included most of them at the time as well. The decision not to back the Shiites and Kurds against Saddam Hussein once they took up arms was also likely a result of lack of contingency planning and political will on the Coalition and U.N.’s part. Most likely President Bush and his commanders encouraged the Iraqis to revolt in the hopes that either a regime change in Baghdad would make a ground campaign to liberate Kuwait unnecessary, or at least force the Iraqi army to fight on several fronts and dilute the forces opposing them in Kuwait and southern Iraq. In other words, the Coalition’s pleas for the Iraqi people to rebel against Saddam was arguably primarily motivated by a desire to ease the liberation of Kuwait, not to free Iraq from tyranny. As soon as Coalition forces had freed Kuwait their main rationale for advocating open rebellion against the Baathist regime in Baghdad became redundant and thus their support for the Iraqi people abruptly stopped. Whether of not Bush knew that the Shiites in the South, or the Kurds in the North, would rise against Saddam is unimportant; the results are well known. Without foreign assistance, and thanks to an important miscalculation in the ceasefire agreement that allowed the Iraqis to continue to operate their helicopters in the war zone, the Iraqi army quickly quashed the rebellion in the South and nearly destroyed the one in the North. While it had proven itself to be unable to wage modern warfare, the Iraqi army still had decades of experience of systemically oppressing its own people. After all the high minded rhetoric Bush had used to justify the conflict in the Gulf, the passive stance of Coalition forces in the face of Saddam slaughtering his own people disgusted public opinion in the West. Because of this the Americans belatedly created a no fly zone in North and South Iraq and prevented the Iraqi army from quashing the Kurds just in time. While Saddam Hussein had more or less been de-clawed, the episode cast a dark shadow over what had up to then been an unequivocal decisive Coalition victory. Having survived the war and subsequent insurrection, more thanks to American discretion than to his own prowess, Saddam Hussein claimed victory. This is a typical stratagem used in a region full of militaries that are more designed to keep rulers in power than fight wars, and half baked insurgencies and terrorist networks, most of which have failed abysmally to accomplish their goals. From the combined Arab armies failing to crush Israel in 1948, to the disaster of the “Six Day War” in 1967, from the multi-hood of terrorist organizations dedicated to eradicating Israel, to the “Iran-Iraq” war which caused a million casualties for no purpose, there has never been so many “victories” for so little gain. Yet perception is important in the Middle East, and Saddam Hussein would prove to be a considerable inconvenience to the West during the next decade. Perhaps of graver consequence is that it is not hard to draw a line from the “Gulf War,” to 9/11 and the “Iraq War.” While the “Gulf War” did not guarantee these later events would happen, it is safe to say they would not have occurred without it. Osama Bin Laden’s decision to wage holy war against the United States was a direct result of Americans troops being stationed in Saudi Arabia, the holy land of Mecca and Medina (Islam’s most important cities). Hypocritically even though Bin Laden seems to have had no issues regarding U.S. military aid that helped drive the Soviets from Afghanistan, he was obviously less grateful that the Americans had saved Saudi Arabia, his own country, from the grip of Saddam Hussein. Encouraged by the Mujaheddin’s success in Afghanistan against the Soviets and U.S. withdrawals from the region such as from Lebanon after the “Barracks bombing” in 1983 and Somalia after the “Battle of Mogadishu” in 1993, Osama Bin Laden was convinced he could slowly bleed the Americans until they lost political will and left the region for good. The next decade would witness an escalation of Al-Qaida attacks against U.S. interests, from the U.S. embassy bombings in Africa in 1998, the attack on the USS Cole off Yemen in 2000 and finally to the deadly attacks on September 11, 2011. The “Iraq War” originated from the end of the Gulf conflict. The decisions not to overthrow Saddam Hussein, to refrain from helping the Shiites and Kurds, and to impose sanctions and no-fly zones on Iraq left an ugly, and unsolved situation, at the heart of the Middle East. Iraq’s substantial remaining weapons of mass destruction were clearly a concern as he had not only used his chemical weapons against the Kurds and Iranians but had also been a few years away from acquiring nuclear weapons on the eve of the “Gulf War.” However, with hindsight, and as stated above it would appear that despite the relatively long and toothless implementation of 17 U.N. resolutions Iraq’s WMD capabilities were eventually neutralized. Yet despite this, and the fact that supposed Iraqi connections to Al-Qaida were unequivocally false in lieu of the American invasion in 2003, there is no doubt that Saddam Hussein’s regime remained an untrustworthy rogue state. Saddam’s efforts to give sanctuary to those responsible for the first “World Trade Center bombing in 1993,” his continuation of building lavish palaces for himself while his people starved and his support of terrorist organizations all suggest he was not keen on trying improve the reputation of his country. While none of this suggests that America had indisputable justification for going to war against Iraq in 2003, Saddam and his rotten Baathist regime undoubtedly deserved their fate to be consigned to the ash-bin of history. Another consequence of the Gulf conflict was to further convince the Arabs and Iranians the futility of engaging the Americans and Israelis in direct conventional warfare. With the exception of two instances, the recent history of conventionally warfare between the Arabs and Westernized forces has been a catalogue of unequivocal Arab defeats. Only Jordan’s seizure and retention of the West Bank in the 1948 conflict, and Egypt’s initial efforts during the “Yom Kippur War” in 1973, were clear successes, and even then they did not win their respective wars. Barry Rubin, in an excellent study on modern conflicts in the region has noted that the same qualities that allow Arab militaries to keep their political leaders in power (promotion based on loyalty rather than competence, the creation of competing rather than collaborative structures in the forces, and encouraging subordinates to be suspicious instead of trusting of each other) have an extremely debilitating effect on their performance when engaging in conventional warfare. However, in the same study he notes that the Arabs are also very adept, at least at the tactical level, regarding irregular conflict such as guerrilla warfare and terrorism. He stresses tactical level because despite Arab prowess at irregular warfare the majority of insurgent and terrorist causes in the region, much like in the rest of the world, have failed to accomplish their goals. Of the few victories, mostly against occupation by colonial or foreign powers, it has always been the result of the occupying force losing political resolve, rather than suffering military defeat at the hands of the insurgents. While it could be argued that the insurgencies were often the major cause of the occupiers losing their resolve there is an important lesson here. 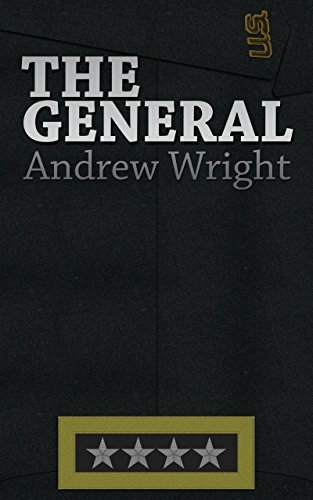 The main point is that in most situations where the insurgents won the other side typically has not faced annihilation, or even risked major interests during such conflicts. Russia in Afghanistan, France in Algeria, and Israel in Lebanon all withdrew in good order, not having been defeated on the battlefield, and certainly did not lose much when they left. Arab insurgencies and terrorist organization such as Al-Qaida, Hamas, Fatah, and the Muslim Brotherhood have had less success against despotic regimes and Israel that were fighting for their survival and have had no where to go. Due to the fact the Arabs have been unsuccessful in conventional warfare at the tactical level, and irregular warfare at the strategic level, they have adapted, at least in Hezbollah and Hamas’ cases by imitating a stratagem used by Saddam Hussein during the “Gulf War.” One of the few Iraqi successes during the conflict was the inability of the Coalition planes to find and destroy Saddam’s mobile scud launchers. While the scuds were faulty in a conventional warfare setting due to their notorious inaccuracy, its random trajectory was actually an asset in the use of terrorizing civilians. In fact the Iraqis had used scuds as such in the “Iran-Iraq War” and had killed 1000s of Iranians in Tehran and other cities. They were perfect weapons for terrorist organizations. The modern origins for such tactics originate from the V-1s and V-2s during “World War 2.” Like scud missiles they were tactically and strategically ineffective yet caused considerable civilian casualties and forced the British to invest disproportionate resources to combat them. Much like the Coalition in the “Gulf War” and the Israelis in 2006, the British tried to solve the problem via Airpower, but the mobile nature of the V-1s and V-2s made them hard to find, let alone, destroy. However, unlike those previous conflicts “World War 2” was an all out war and the British ultimately did what was necessary and used troops to overrun the launch sites and thus pushed the German weapons out of range of England, defeating their purpose. This lesson, the necessity of ground troops to overrun hostile launch sites to effectively neutralize such irregular weapons as hastily assembled mobile rocket or missile weapons of terror was lost on the Coalition in 1991 and the Israelis in 2006. However, the Israelis clearly got the point and during the “Gaza War” in 2009 they used ground troops to occupy much of the launching points of such weapons and severely constricted Hamas’s capabilities to terrorize Israel. Yet, despite the failure of insurgent and terrorist organizations to change the political landscape of the region in their favor, they are extremely resilient and adaptive, and as long as they, or the conditions that facilitated their existence, exist, the cycle of violence and instability will continue. Yet despite all of the negative consequences of the “Gulf War” it would be wrong to suggest that it was an unjust, or even futile, conflict. The Coalition clearly accomplished its stated aim by Liberating Kuwait. Those who feel as though it was wrong to push Saddam’s forces from Kuwait should ask the Kuwaitis if they preferred the rule of their monarchy or Iraqi jackboots. While Kuwait is not a liberal democracy, it is relatively stable, prosperous and safe compared to most countries outside of the United States and Western Europe. However Kuwait did tarnish its reputation after the war when it deported an estimated 450,000 Palestinians from the country in revenge for the P.L.O.’s support for Saddam Hussein during the conflict. This act provoked little media attention or public outcry but was another example of how the Arab world treats the Palestinians no better than the Israelis. Yet this should come as no surprise as most of the people who demonize Israel in the West are generally ignorant regarding, or simply do no care about, the countless unjust things the Arab countries have done to the Palestinians over the years. Despite this tragedy the American military won a quick and decisive victory which repaired its tarnished reputation from Vietnam and allowed it to regain its confidence. This, along with the fall of the Soviet Union at the end of year, left America the world’s sole superpower and confirmed the victory of democracy and capitalism vs. communism. While undoubtedly the Americans and the West have done many immoral things in the name of expediency there is no doubt that their victory was preferable to a communist one. A simple look at some statistics should confirm this. Whatever crimes, real or imagined, the Americans committed in Korea, Vietnam or Central America they are far from the scale of Stalin killing 14 million of his own people, Mao killing tens of millions of his own, Pol Pot 2 million of Cambodia’s mere 7 million, and the mass starvation and deprivation of the Orwellian regime in North Korea. Another good indicator, besides death counts, would be emigration patterns. During the “Cold War” many more people fled from communist countries to the West than vice versa. In Vietnam 1 million people fled the South after the division of the country in two in 1954 and another 2 million fled from the South after its conquest by North Vietnam in 1975. In Berlin, so many people left the Soviets had to construct a wall to keep people in. Two million people even fled from Cuba, supposedly the model communist country (how many Americans do you see floating on rafts to get to Havana?). To suggest that the Communists had right on their side during the “Cold War” is blatantly naive. Additionally, while the ill effects of “the Gulf War” are known it is worth speculating what would have happened if the Americans, and the Coalition, had done nothing. As difficult as it is to imagine what if history, the likely results would not have made for a more peaceful, or stable, world. Firstly, Saddam Hussein would have been in control of at least 20% of the world’s proven oil reserves, and without American protection, could have easily overran Saudi Arabia and conquered another 20%. While there is no way to know whether or not he would have invaded Saudi Arabia, if he had never been punished for invading Iran or Kuwait there would have been little reason for him to expect that further bellicose actions would have been resisted. Just as Hitler in the 1930s, appeasement would never have constrained Saddam Hussein. It is possible that without American intervention that Bin Laden would have eventually launched a holy war against Iraqi troops in Kuwait, instigating a brutal conflict, a sharp rise in the price of oil, and perhaps even an Iraqi invasion of Saudi Arabia. As unlikely as this scenario seems, it had no chance of happening as soon as the Americans guaranteed to protect Saudi Arabia. Finally, without the “Gulf War” and subsequently U.N. inspectors scouring Iraq Saddam Hussein would probably have finished his nuclear program during the 1990s and acquired nuclear weapons. Given that Iraq was a rogue states, had invaded two countries that posed no real threat to her, had launched scuds against 2 more, was a well known sponsor of terrorism, and had even used chemical weapons, its entry into the nuclear club would hardly have been reassuring to the relatively peaceful status quo during the 1990s. No matter how bad the negative effects of the “Gulf War” were there is no doubt that a nuclear armed Iraq, threatening the majority of the world’s proven oil reserves, would have been a much worse alternative. Cohen, Elliot and Thomas Keaney. Gulf War Air Power Survey Summary Report. Washington D.C: U.S. Government Printing Office, 1993. Creveld, Martin Van. The Age of Airpower. New York: Public Affairs Books, 2011. Lewis, Jon. The Mammoth Book of Battles. London: Robinson Publishing, 2000. Scales, Robert. Firepower in Limited War. Novato: Presidio Press, 1995. Schott, Ian. World Famous Battles. London: Magpie Books, 2004. Wragg, David. Snatching Defeat from the Jaws of Victory. Phoenix Mill: Sutton Publishing, 2000.